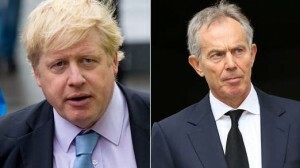 Boris Johnson has launched a stinging attack on Tony Blair by claiming he has “finally gone mad” after insisting the current crisis in Iraq was caused by a failure to deal with the Syria conflict – not the 2003 US-led invasion. Writing in his Daily Telegraph column, the Mayor of London said Mr Blair and then-US president George W Bush had shown “unbelievable arrogance” to believe toppling Saddam Hussein would not result in instability. He went as far as accusing the ex-Labour leader of having sent British forces into the bloody conflict in part to gain personal “grandeur”. He suggested there were “specific and targeted” actions that could be taken by the US and its allies to deal with the latest threat – as President Barack Obama considers a range of military options short of ground troops. But he said that by refusing to accept that the 2003 war was “a tragic mistake”, Mr Blair was “now undermining the very cause he advocates: the possibility of serious and effective intervention”. “Somebody needs to get on to Tony Blair and tell him to put a sock in it, or at least to accept the reality of the disaster he helped to engender. Then he might be worth hearing,” Mr Johnson said. Speaking to Sky News’ Dermot Murnaghan, Mr Blair said the West’s inability to get tough with Syrian President Bashar al Assad and failure in Libya had allowed terrorism and chaos to spread across the Middle East. Mr Blair told Murnaghan: “Some people will say ‘well if we hadn’t removed Saddam in 2003 we wouldn’t have the problem today in Iraq and the reason I think that is profoundly mistaken is this: since 2011 there have been these Arab revolutions sweeping across the whole of the region – Tunisia, Libya, Yemen, Egypt, Bahrain, next door to Iraq in Syria – and we can see what would have happened if we left Saddam there in 2003. Clare Short, who quit Mr Blair’s cabinet in the aftermath of the 2003 invasion, added her voice to the critical chorus saying he had been “absolutely, consistently wrong, wrong, wrong” on the issue. UKIP leader Nigel Farage dismissed Mr Blair as an “embarrassment” who should hold his tongue – and demanded “an end to the era of military intervention abroad”. And Sir Christopher Meyer, Britain’s ambassador to the US from 1997 to 2003, said the handling of the campaign against Saddam was “perhaps the most significant reason” for today’s violence.